From the Norman invasion of England in 1066 to the D-Day landings of 1944, Normandy has long played an outsized role in European history. Our guides here are extremely busy, taking bookings up to a year in advance for private tours of Omaha Beach, Mont St Michel, Caen, Bayeux and countless other sites rich in French history and culture. Today one of these special guides joins us to share his love for tracing back generations of Norman history. Introducing ToursByLocals guide Igor. A few months ago, a Norwegian family contacted me to prepare a tour about their Viking ancestors, who had settled in Normandy. They asked me whether I could research and trace back their family roots from 700AD to modern times. At first I thought that I would never find anything this old, but as a great fan of the Vikings, I decided that I couldn’t turn down such a challenge! The research brought me first to Orbec, the closest village to my hometown, to look at wedding and death records prior to the French Revolution. Then I went to see the castle of Tournebu, literally, “the Village of Thor” (“Bu” means Village in Norse and “Tourne”, comes from the word “Thor”, the Viking god of thunder). No one ever visits this castle. In winter you have to climb through mud and hedges to get to the dungeon, but what a feeling to discover alone the abandoned crypt and cellars where no one has gone for centuries. I discovered that the village’s cemetery has also some very intriguing crows on a rock, another Viking symbol. The neighbour of the castle told me that Winston Churchill’s grandson recently bought the place, so perhaps it will not remain deserted for long. Next I carried on to Magny le Freulle, where Andre De Leusse invited me to see another castle of the family. Even though he has been married for 50 years to a member of the prestigious de La Rochefoucauld family, and has owned the place for generations, he didn’t know who had built his castle before the 15th century – exploring the castle, we both learned something that day. This sort of research is something I love doing for my clients, and has become a regular part of many of my tours. Living in Normandy, one feels the privilege of being in a place where you can still see and touch history every day. •Overlooking the Seine River, on the battlements of Château Gaillard, you clearly see the armies of Philippe Augustus coming to attack Richard the Lion Heart in his “Brave fortress”. •In Caen, in the moat of William the Conqueror’s castle, you can understand why he chose this place to control his huge kingdom, and how massive each of his castles had to be. •Near Rouen, at Pont de l’Arche in Oissel, for the Vikings fan, you can envision Rollo and Ragnar Lothbrok attacking the armies of Charles the Bald and lifting their ships up the limestone cliffs. Come to Normandy, and let me bring history to life for you. Thank you Igor! 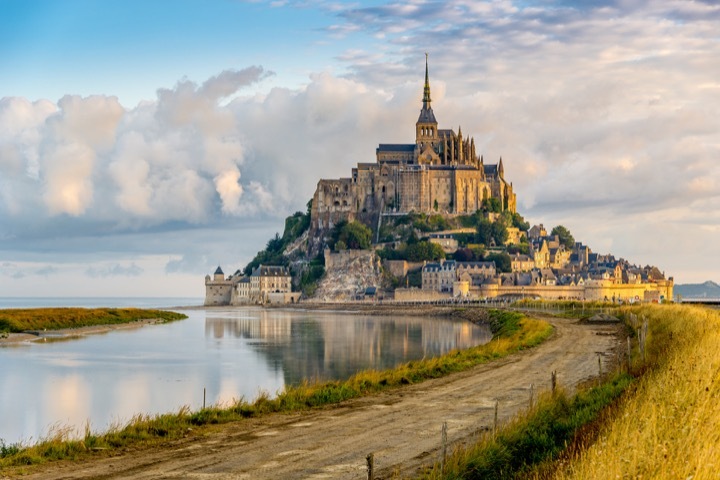 For any travelers visiting this part of France in 2017 or beyond, consider getting in touch with Igor before your trip and experience the magic of Normandy with a guide who loves bringing it to life for visitors.